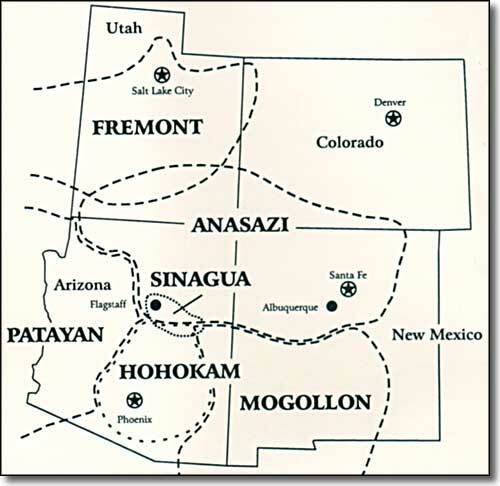 "Anasazi" is a Navajo word that, depending on pronunciation, can mean "enemy ancestors" or "ancient people who are not us." 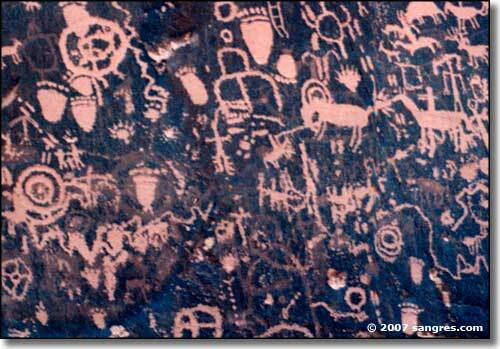 The Anasazi were the forebears of the Hopi, the Zuni and the Rio Grande Puebloan Indian tribes of the Southwest. They built a great civilization in some pretty barren landscape. At Chaco Canyon they were living in 5-story cities, hundreds of rooms per building, at a time when most Europeans were living in thatched huts. Chaco Canyon seems to have been a center for them for a long time because we have found many roads leading out from there, like spokes on a wheel, connecting Chaco with Zuni, Mesa Verde, the Hopi Mesas, and the Rio Grande Pueblos. Trade routes went as far south as Central America and there was significant traffic in tropical birds and seashells, items used in religious rituals by most Southwest Indians. 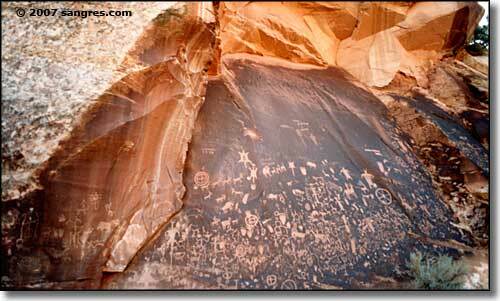 Newspaper Rock is next to a perennial spring near Canyonlands National Park. Because of the spring, people from miles around would travel through here and leave messages on the rock for other travelers. At the end of the last Ice Age, the Southwest was being vacated by the big game hunters as they followed the retreat of the glaciers northward. After the hunters moved north, a society of hunter-gatherers moved in from the south. This ancient group of foragers (about 6000 BC to the first century CE) were highly mobile, carrying only lightweight tool kits and "atlatls," sticks to extend their spear-throwing range. They traveled in small family groups of from 3 to 8 and were almost continually on the move, stopping just long enough to build crude huts and sleeping circles. What we know of them is found mostly among the stone chips left from their tool-making. Scholars call these people the Archaic or Desert Culture. It is thought that the Anasazi were either a northern branch of the Archaic people or they may have been northern settlers of the Mogollon Culture, which was located more in southern New Mexico. Somewhere in the first or second century CE the first signs of a distinct Anasazi culture began to emerge. The Anasazi were dry-farmers, timing their planting so as to best use the moisture of spring snowmelt and summer rains. Fields were often planted in sand dunes or near a spring or in the mouth of an arroyo. Over time, the Anasazi built up layers of rock terraces on hillsides and systems of check dams across creeks to direct water flows onto their crops. At Mesa Verde they built a half-million gallon reservoir. In a few places they built irrigation canals. About 500 CE, three major innovations revolutionized their way of life: permanent pithouse dwellings, pottery and the bow and arrow. The bow and arrow made hunting easier. Pottery made food storage easier. 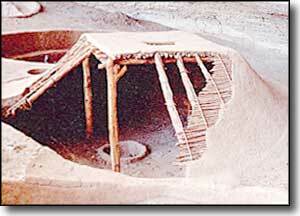 As the Anasazi settled more and more into a farming lifestyle, they built permanent pithouse dwellings. Pithouses could take any shape but basically, 4 strong upright posts were crossed with ceiling joists and overlaid with a lattice of brush, thin poles and a bark or grass matting. Quite often they would place a sod-like covering over the top for extra insulation and protection from the elements. By 700 CE, most Anasazi builders had shifted their construction from subterranean to aboveground. This was the beginning of Pueblo construction. Shaped rock with meticulous mortar work was laid up to create up to 5-story, many-roomed structures where thousands of people had their homes inside the "building." Often the excellent masonry work was plastered with mud, inside and out, and sometimes it was whitewashed. This pueblo architecture was the standard dwelling form for nearly five centuries. The three distinctive masonry styles of the era are exhibited in the three major centers of Anasazi culture: Mesa Verde (best known), Chaco Canyon (the finest) and Kayenta (least carefully executed). Pithouse construction persisted in the more rugged area around Kayenta into the 13th century. The Anasazi of the northern Mesa Verde-San Juan area also built square, round and D-shaped stone towers several stories high in the area of Hovenweep on the Utah-Colorado border. We don't know if these towers served a communicational or astronomical function. The development of pueblo architecture seems to have reached a peak at Yellow Jacket, near Cortez, Colorado, where more than 1800 rooms arranged along streets may have housed up to 3,000 people. At Chaco Canyon, activity began about 900 CE. Construction boomed about 1030 and by 1100 there were nine great houses built in the valley with irrigation systems and an extensive road network connecting Chaco with a large network of outlying towns. However, in the 1130's, precipitation declined and the ability of the land to support the prople declined with it. The Chacoans apparently packed their belongings and left in an orderly manner and by the early 1150's, Chaco Canyon was completely abandoned. In the northern San Juan-Mesa Verde area, small families of Anasazi were living in pithouses by 600 CE. By 1100, most of the area's population (perhaps 30,000 people) was concentrated in the Montezuma Valley at places like Yellow Jacket, Goodman Point and Lowry. About 1200 CE these people moved up to the pueblo style cliff dwellings in Mesa Verde National Park itself and finally abandoned the region by 1300 CE. 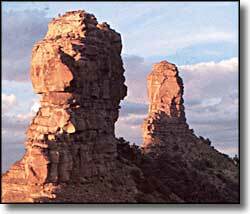 The Kayenta area (Black Mesa, Navajo Mountain, Tsegi Canyon) saw Anasazi living in pithouses by 400 CE. After a while, the folks from Black Mesa moved into the Red Lake and Klethla valleys. About 975 CE Black Mesa was reoccupied and the population grew dramatically. After 1150, the area was abandoned. In each case above, abandonment followed population growth. With population pressure, planned villages were replaced with more casual architecture, regional trade ties fell apart and the social structure broke down. Population pressure was directly influenced by the amount of rainfall every year and long term precipitation deficits wreaked havoc with the Anasazi. During the 13th century, the Anasazi retreated for a while to cliff dwellings in sandstone canyons, places like Canyon de Chelly, Betatakin and Keet Seel. However, by 1300 CE, these sites were abandoned, too. The floor plan to the left is of the Great House at Chimney Rock, just west of Pagosa Springs, Colorado. If you travel around the Southwest extensively, you'll find Anasazi ruins almost everywhere. You'll also find that they are built with certain ceremonial structures whose design varies very little over the centuries. 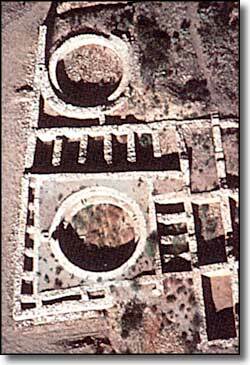 The circular foundations in the photo are most likely kivas. Kivas are religious structures built into the ground with a particular astronomic orientation. Different kivas are used at different times of year for different ceremonies. Nearly every Anasazi ruin has at least one kiva present somewhere in the building complex. Hopi legends tell the story of the arrival and migrations of their people across the American continents. They also tell of where the people settled for particular periods of time, why they settled there and why they later moved on. These legends are the basis for Hopi history and are told in some of their ceremonies. All of their ceremonies include visits to different kivas as part of the rituals. Each kiva has its own group of participants and it is the job of each member of that kiva to participate fully in their own parts of the ceremony so that the entire ritual can be completed properly. The Anasazi did not disapper, they moved east and south, settling in northern New Mexico and central Arizona - along the upper Rio Grande, the Upper Pecos, the Rio Puerco and the upper Little Colorado. These areas are considered to be ancestral homelands by the Zuni, Hopi and Rio Grande Pueblos. The area we now call "Bandelier," in particular, was a popular refuge for Anasazi, Chacoans and northern San Juan people fleeing the drought devastating their homelands. 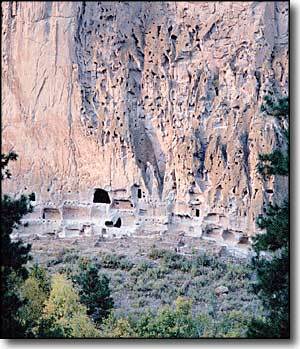 Located in the high, forested lands of the Pajarito Plateau, Bandelier was an oasis to them. During the 14th and 15th centuries, they built pueblos up the faces of the volcanic rock cliffs and, in other areas, in the open along the streams here. By the time the Spaniards arrived in the mid 1500's, they had moved on to the Rio Grande Pueblos where we find their descendants today. Some of these photos and maps are courtesy of the National Park Service. Other photos courtesy of Sangres.com, CCA ShareAlike 3.0 License. All text Copyright © by Sangres.com. All rights reserved.